Brewed with Balls is a hilarious and colourful collection of the wackiest beers on the planet. From squid ink to collagen and, yes, real whales’ testicles, you’d be hard pressed to come up with a more eclectic list of ingredients in any cook book. 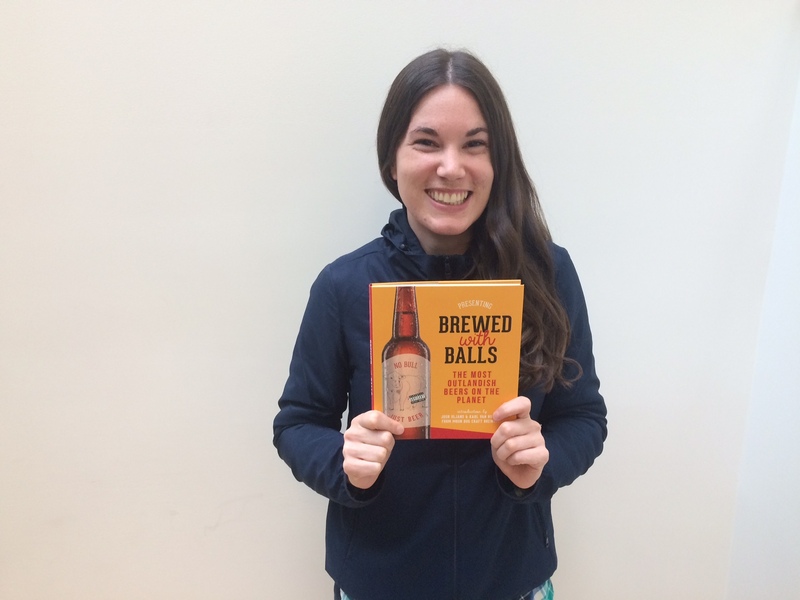 We caught up with the book’s creator and Affirm Press’ publishing coordinator, Steph, to find out what inspired her to suggest a book on bizarre beer. Steph, congratulations on a beautiful book. Has it turned out how you imagined? Thanks very much! It was a real team effort. I first pitched the idea having seen an article about Dock Street Brewery’s ‘Ain’t Nothing to Funk With’ – a golden saison barrel-aged with the music of Wu Tang Clan. Being a beer and a hip-hop lover I had to investigate, and I realised there are heaps of weird and wacky beers out there but no books dedicated to them. So the idea was born, and Martin and Keiran were foolish cool enough to give me a go at it! I’m so happy with the end result – Karen’s design is just so fantastic, it really next-levels it! I think the book is a great gift for anyone interested in beer that likes to have a good laugh and doesn’t take it too seriously. It’s a bit a fun for the beer lovers out there! Is this the first book you’ve project managed? How was the experience? I have project managed books before but not on this level, like actually creating content. So it was definitely a learning curb but I totally loved it! One of the hardest parts of the project was sourcing images that were both interesting and high enough quality to print. It’s things like that you wouldn’t think of until you’re faced with them. The words were probably the easiest part, especially with our amazing editor Ruby finessing them for me! Researching the beers was cool too because I learnt heaps about brewing processes along the way – I’m still no expert but I can throw a few choice words around now! What were the best breweries to work with? Moon Dog have been amazing. They are such a great bunch. Josh chatted to me at the very start of the project and suggested other breweries to look into and they’ve been involved the whole way through. All of the Australian breweries have been great and were all really keen to be involved. Rogue from the United States were awesome too and they do some really interesting beers, I’d love to visit them in Portland. The two Icelandic breweries were also great. Most of the breweries I contacted jumped straight on board, which was really cool. Especially because they’re from all over the world – it’s actually a pretty amazing thing. There’s definitely a sense of community in the brewing world and it’s really supportive and encouraging, which was nice to see. You had some fun with the publicity around this book. There’s even a book beer brewing. What can punters expect from the Affirm Press beer? The publicity has been great fun and such a bonus! We all got to try the weird beers we bought from Slow Beer in the office, which was hilarious. And I got to help brew our special ‘Ink and Tears’ book beer at Moon Dog – to say I was totally stoked would be an understatement! Without giving too much away, you can expect the unexpected in the Ink and Tears – and let’s just say it has a Japanese theme to it … That’s all I’m saying – if you want to try it you’ll have to come to the launch on the 1 July at Moon Dog! Watch the Affirm Press team sampling some of the wacky brews in the book.